Photos by Rachel Von | The Journal Gazette Trevor Parker rearranges Lego pieces Sunday in the FortLUG display at Brickworld at Grand Wayne Center in downtown Fort Wayne. 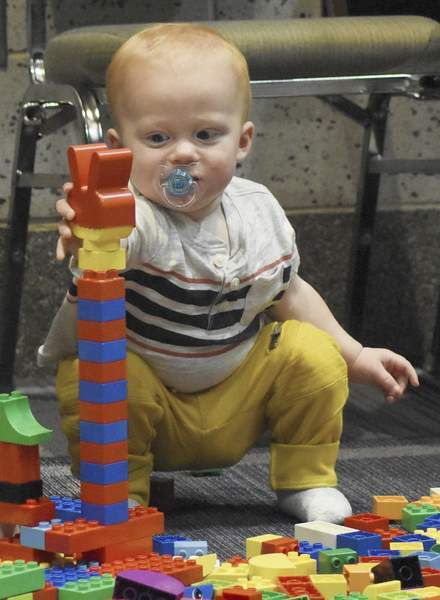 Calvin Horn, 16 months old, builds a Lego tower in the children’s play area of Brickworld. The event is organized by ex-city resident Bryan Bonahoom. Rachel Von | The Journal Gazette Bill Anjo aka Mr. Red works on a piece of "The Great Ball Contraption" during Brickworld at the Grand Wayne Center on Sunday. 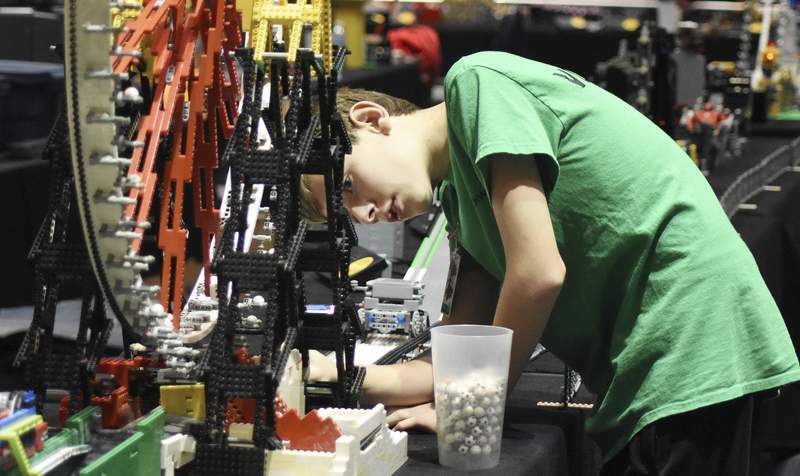 Rachel Von | The Journal Gazette Volunteer Mitchell Aldred, 12, works on the Ferris wheel on "The Great Ball Contraption" during Brickworld at the Grand Wayne Center on Sunday. Rachel Von | The Journal Gazette Guests look for items in "Oriental Gardens" built by James Burrows during Brickworld at the Grand Wayne Center on Sunday. 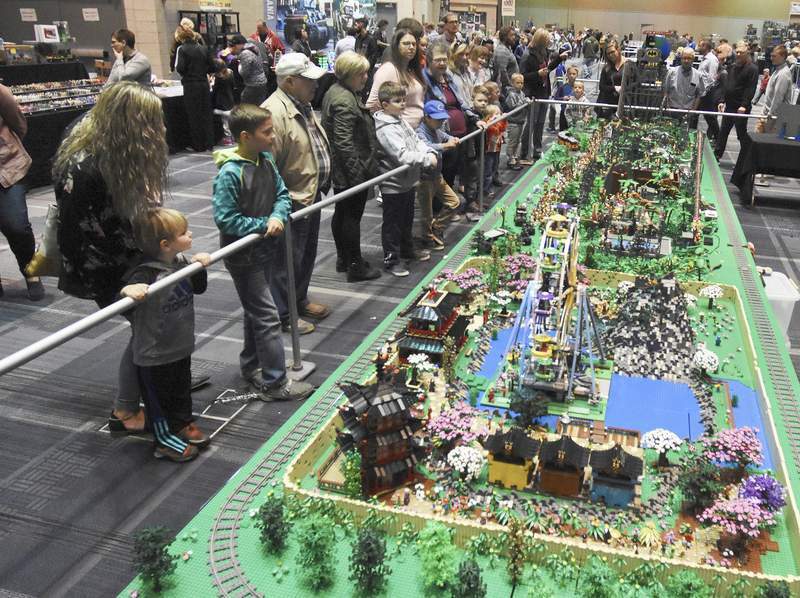 Rachel Von | The Journal Gazette A train goes by in the FortLUG display during Brickworld at the Grand Wayne Center on Sunday. 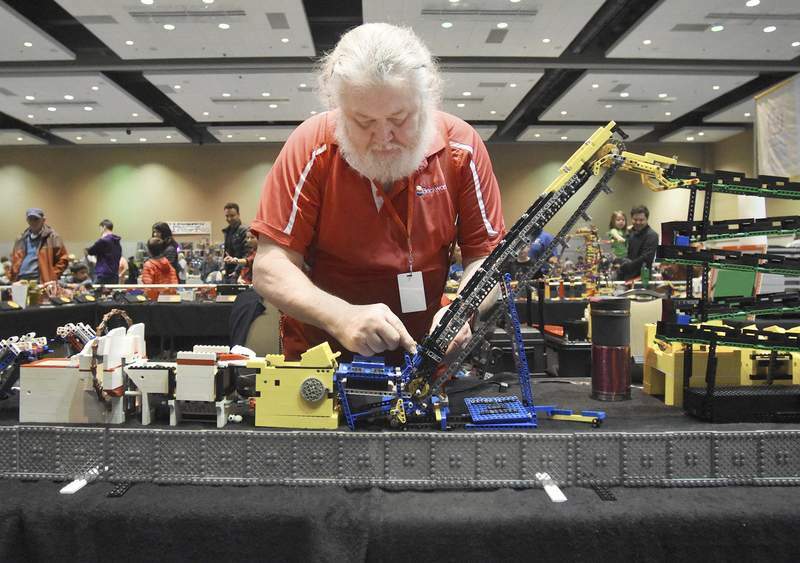 Brad Sweet seemed eager Sunday to share the fun of the Great Ball Contraption – a Lego creation comprising numerous components that carried, lifted and pushed countless balls across more than a dozen tables in Grand Wayne Center. The Ferris wheel and conveyor belts wouldn't have anything to move if it weren't for Sweet, who let spectators push balls into play with a remote-controlled vehicle also made of Lego bricks. 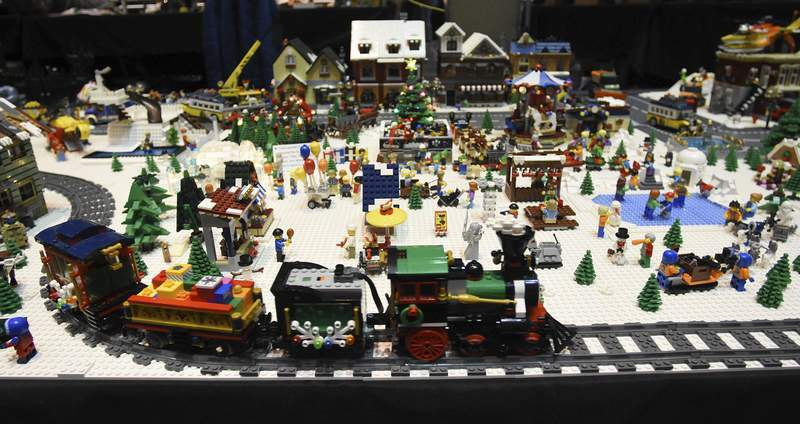 The contraption was among the attractions at Brickworld, which bills itself as the premier Lego fan experience in North America and features displays built by hobby enthusiasts. The event has come to Fort Wayne since 2011 – and not by coincidence. Executive Director Bryan Bonahoom is a former city resident; he now lives in Fishers. 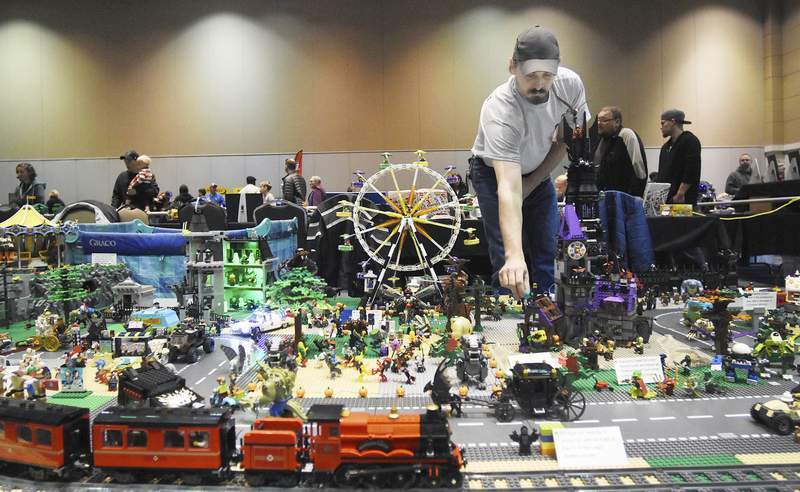 Fort Wayne isn't the most profitable show, he said, but Brickworld isn't about the money. Instead, he said, it's about the “educational and inspirational value” of Lego bricks. Along with kits and bricks for purchase, Brickworld offered attendees hands-on opportunities to create. Areas included a graffiti wall and a Duplo section for youngsters. Amanda Smith and her 4-year-old nephew, Peter Smith, were among those gathered around a table covered in green bricks that some turned into pyramids and towers. Steps away, people paused to marvel at the display by FortLUG, the group of adult Lego enthusiasts based in and around northeast Indiana. LUG stands for Lego Users Group. FortLUG's display reflected members' varying interests, including Technic sets, Star Wars and cityscapes, said Ed DeWitt, president. The exhibit also included trivia about Lego, including the number of ice cream flavors offered (11) and the apparent favorite (vanilla, which appears in more than 30 sets). “We all have things we're passionate about,” DeWitt said. Both FortLUG and Brickworld are great places to connect with other adults who like Lego, member Kimberly Schutt said. The two-day show is particularly helpful, she added, because participants learn from one another, such as how to build certain items, where to buy parts and tips for transporting displays.